Some users may experience problems when attempting to upload pension information to NEST, especially when attempting to do this for the first time. The majority of these errors are caused by a mis-match of information between what has been entered on the NEST website (when initially setting up the NEST pension scheme) and the data that has been entered into Payroll Manager. When NEST reject your submission (for whatever reason) they usually report back with an error code in the format ‘IFC012345’. Please note that these error codes are generated by NEST and not by Moneysoft, and so if it is not immediately obvious what is causing the problem then you should contact NEST directly to ask them what the error code means. The NEST Customer Support number is 0300 020 0393. NEST also have an error message guide on their website which may help you with any problems that you are having – see NEST Web Services Error Messages (a downloadable spreadsheet). This guide is not particularly easy to read, but may help give you an indication as to where the problem lies. Error 401 – NEST tell us that this error message is produced “When the user cannot be identified with the username provided or the password for the user is incorrect“. 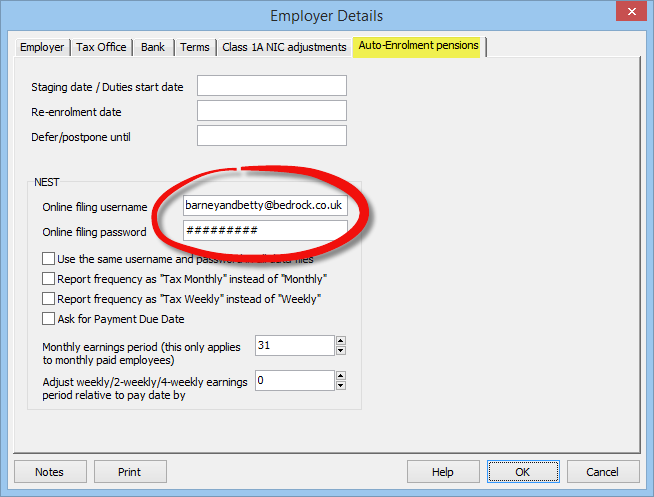 You should check the username and password that you have entered in Payroll Manager by clicking ‘Employer‘ then ‘Employer Details‘ and then selecting the ‘Auto-Enrolment pensions‘ tab. The username and password that you enter here should be the same username and password that you would use to log onto the NEST website. You should make any necessary amendments and try again. If you still experience problems then you should contact NEST directly to ask why they are rejecting your credentials (Note: Moneysoft cannot tell you what your NEST username and password are – Payroll Manager simply submits whatever you have entered in these fields to NEST). If you are still experiencing problems after reading these guides then you should contact NEST directly and ask them to explain the cause of any errors. . Please note that it is the NEST system that generates these coded error messages and not Moneysoft, and as such it is only NEST that can tell you why they are generated.